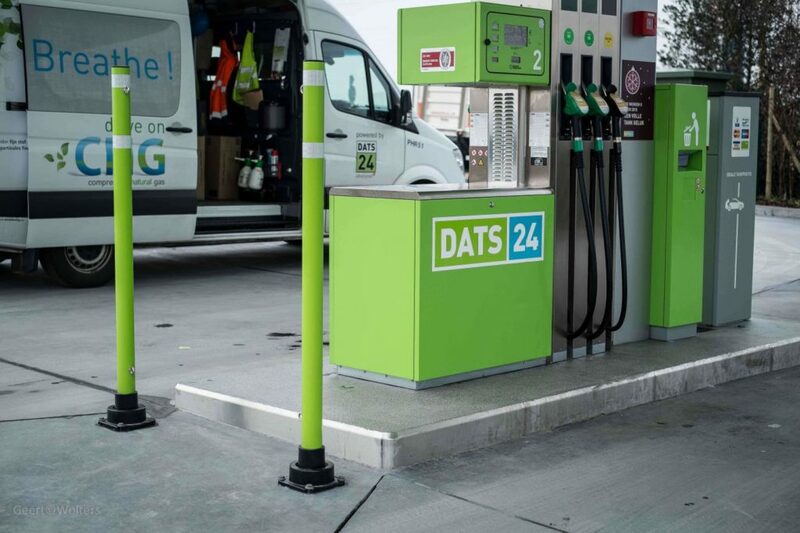 DATS 24, Colruyt Group’s fuel supplier, has recently opens its 63rd CNG filling station in Knokke. This is the starting signal for the opening of 25 new sites where natural gas can be refueled as part of the DATS 24 network in Flanders and Wallonia. Other locations include Sint-Truiden, Tienen, Sint-Pieters-Leeuw, Wommelgem and Ronse alongside Eupen, Beyne-Heusay, Basecles, Ath, Thuin, Frameries, Amay, Nivelles and Tournai. Natural gas cars are always affordable, can be used by everyone and straightaway, contributing towards better air quality. The effect of this is that an increasing number of natural gas vehicles are being registered in Belgium. By 2020, the number of CNG stations in Belgium is expected to increase from 110 to 170. In addition to DATS 24, almost all other fuel suppliers have started constructing CNG facilities at their filling stations. In Europe, CNG is making rapid progress too, with ambitious expansion plans in France (+250), Spain (+300), Germany (+1,000) and Italy (+300), among other countries. “Air quality is deteriorating sharply in Belgium, especially in Flanders. Drivers want to be green, but with the same level comfort and at no extra cost. CNG vehicles certainly offer the huge advantage of being cheaper and drivable everywhere, as well as making a substantial contribution to a healthier living environment,” said Raf Flebus, Business Unit Manager of DATS 24. According to FOD Mobiliteit (Federal Public Service Mobility and Transport), around 4,000 CNG cars were registered in 2018. Add to that vans and trucks, and you get 5,000 vehicles: roughly double the number in 2017. At the end of 2018, 14,200 CNG vehicles and 11,900 electric vehicles were on Belgian roads.